Summary: Genetically modified organisms (GMOs) are organisms that have been altered using genetic engineering methods. Although genetic engineering is a common and essential practice in biotechnology, its specific use in crops is controversial. The key steps involved in genetic engineering are identifying a trait of interest, isolating that trait, inserting that trait into a desired organism, and then propagating that organism. Methods for genetic manipulation have rapidly improved over the last century from simple selective breeding, to inserting genes from one organism into another, to more recent methods of directly editing the genome. What qualifies as a GMO? A common misconception is that any animal or plant considered to be outside the realm of our reference for “natural” is a GMO. Images of abnormally large cows and tomatoes come to mind. However, the scientific community and the U.S. Food and Drug Administration (FDA) use a stricter definition for a GMO: an animal or plant that has been created through genetic engineering . Genetic engineering is a term used to describe biotechnological methods used by scientists to directly manipulate an organism’s genome. Under this definition GMOs do not include plants or animals made by selective breeding, or animals modified by being given hormone supplements or antibiotics. In fact, we do not currently eat any meat products considered to be GMOs, although farm animals may be fed a genetically modified crop . The main goal of the majority of genetic engineering performed on food is to increase crop yield and/or to improve the nutrient value in animal feed. 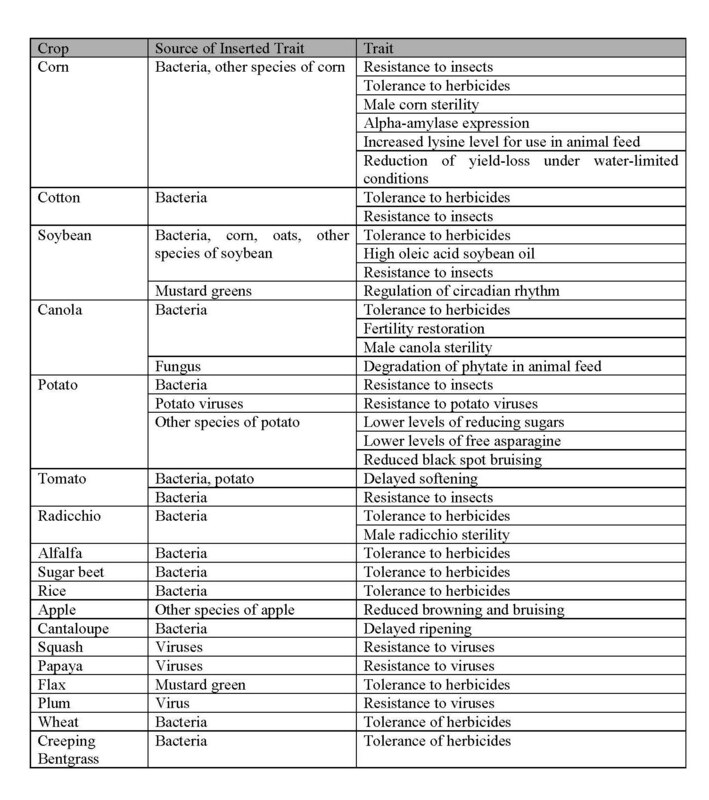 No genetically engineered crops on the market in the United States have been modified to be unusually large (Table 1). Pictures of extremely large vegetables used to support the “Franken-food” image of GMOs are probably not GMOs at all; an unusually large vegetable would more likely be created through less controversial methods of selective breeding or nutrient supplements, not genetic engineering. Genetic engineering is widely used in biological research. Mouse models are engineered for biomedical studies, bacteria are engineered to produce medications such as insulin, and crops are engineered for agriculture. All of these products of genetic engineering were created using the same basic steps: identifying a trait of interest, isolating that genetic trait, inserting that trait into the genome of a desired organism, and then growing the engineered organism (Figure 1). These steps are explained in detail below, using examples from Monsanto as the details of their technologies are publicly available. Other major companies such as Syngenta, BASF, Dow, Bayer, and Du Pont use similar methods, as outlined in brief on their respective websites [3, 4, 5, 6, 7]. In order to identify a desirable new trait scientists most often look to nature. Successful discovery of a new genetic trait of interest is often a combination of critical thinking and luck. For example, if researchers are searching for a trait that would allow a crop to survive in a specific environment, they would look for organisms that naturally are able to survive in that specific environment. Or if researchers are aiming to improve the nutritional content of a crop, they would screen a list of plants that they hypothesize produce a nutrient of interest. An example of a trait currently in GMOs that was identified through this combination of luck and critical thinking is tolerance to the herbicide Roundup (see this article). Monsanto created “Roundup Ready” plants after finding bacteria growing near a Roundup factory that contained a gene that allowed them to survive in the presence of the herbicide . Although it is not on the market in the United States, Syngenta has designed Golden Rice with an increased amount of pro-vitamin A, which the human body may turn into the vitamin A (see this article). Researchers at Syngenta identified the gene sequence that produces pro-vitamin A and compiled a list of plants to screen with that sequence . With a little luck, there was a plant in nature, maize, that contained a gene that would make Golden Rice produce pro-vitamin A at a level that could meet the nutritional needs of vitamin A deficient communities. Comparative analysis is used to decode what part of an organism’s genetic makeup contains the trait of interest. The genomes of plants with the trait are compared to genomes in the same species without the trait, with the goal of identifying genes present only in the former . The genomes of different species with the same trait may also be compared in order to identify a gene, as was the case while developing Golden Rice . If there is no database of genetic information for comparison, scientists will purposefully delete, or “knock out,” parts of the genome of interest until the desired trait is lost, thereby identifying the genes that lead to the trait. In order to expedite this process, Monsanto has developed and patented a method known as seed chipping . Through this method Monsanto shaves off parts of seeds for high-throughput genetic sequencing while leaving the rest of the seeds viable for planting. This creates a genetic database for plants before they are even grown, where a barcode system is used to match plants to their genotypes. Researchers may then use this database to identify new traits of interest as well as to optimize the desirable traits in a crop by selecting for the best genotypes based on plant phenotypes. Altering the genome of plant seeds is difficult due to their rigid structure. Many biotech companies use “gene guns” that shoot metal particles coated with DNA into plant tissue with a .22-caliber charge . Monsanto no longer uses gene guns, but instead takes advantage of bacteria, called Agrobacterium tumefaciens, that naturally invade seeds and alter plants by inserting pieces of their own DNA into a plant’s genome. In biotechnology research it is common to genetically engineer bacteria to produce a desired protein. This is done by using enzymes to cut and paste a DNA strand of interest into a plasmid, which is a small, circular molecule of DNA . Bacteria are then shocked using heat or electricity so that the cells accept the engineered plasmid. By modifying A. tumefaciens, which is easier to modify than plant seeds themselves, researchers may use the bacteria’s naturally invasive behavior as a Trojan horse for inserting desirable traits into a crop’s genome. After a genetic trait has been successfully inserted into an organism’s genome, the modified organism must then be able to grow and replicate with its newly engineered genome. First, the genotype of the organisms must be checked so that researchers are only propagating organisms in which the genome was modified correctly. Biotech companies invest large sums into keeping these plants alive and reproducing once they have been successfully created. The companies use special climate-controlled growth chambers, and biologists often check on the plants by hand to make sure that they are growing as expected . During this process biotech companies will use automated machines, such as Monsanto’s GenV planter, in order to track plants and calculate optimal seeding and growth conditions to create the best possible yields. GMO seeds often come with instructions on spacing and nutrition that result from these studies. Humans’ ability to modify crops for improved yields and nutrients in a given environment is a keystone of agriculture. The technological advancement from selective breeding to genetic engineering has opened up a large realm of possibilities for the future of our food. As techniques for genetic engineering, such as new RNAi- and nuclease-based technologies that allow for direct modification of the genome (see this article and this article), steadily improve, our ability to create new GMOs will also grow . As our scientific capabilities expand it is essential that we discuss the ethics and ideals surrounding GMOs so that we may effectively and safely use this technology in a way that is acceptable to the public. Chelsea Powell is a PhD student in the Chemical Biology Program at Harvard University. 11. Hsu, Patrick D., Eric S. Lander, and Feng Zhang. “Development and Applications of CRISPR-Cas9 for Genome Engineering.” Cell 157.6 (2014): 1262-278.
thanks for all info.they are very useful. If an idiot and an imbecile had a baby it would be you. This is such a great article! Thank you so much for helping my understanding of this subject!! Scientists call genetic engineering using a gene biolistic delivery. Mostly Wikipedia is very accurate, especially so when viewing the English version. Wikipedia is never accurate before. what do u teach ? This is really amazing! My Biology teacher made us read this article, and it was much more interesting than I thought it would be. @SITNFlash this website is more reliable than Wikipedia. haha good point! The gene gun description on wikipedia is pretty good, though. Great website! It has lots of great info! Shame this is the end of “human”. Nice one here. Helpful for my seminar presentation. This is a long good website. fig newtons are named after the FIGS that are in the bar. not the town. Would be interesting to share what you think in term of impacts on health when eating those GMOs ? You have a typo in step 3 of the diagram, it should be insert not inset. Thanks for the simple explanation though. I expect these comments to be a little more scholarly, as of now I am unimpressed. You all fail in life and on here. THIS WORK IS SO NICE AND HAS HELPED ME AND OTHER RESEARCHERS IN THEIR WORK. Thank you for posting this Article, this has very much helped me with my project in my science class. You’ve provided many information that I was able to Ace this ! Thanks for your article. It was very helpful for me in breaking down the steps for GMO for a project in my Biology Class. I know there are a lot more technical details involved with scientific names I can’t pronounce, but when I’m only looking for the basic steps in layman terms, your article is quite helpful. the edit history 2001 none of the edits show that they edited the definition of genetically modified organisms. therefore we can conclude that Harvard has copied Wikipedia you have modified the definition without giving credit to Wikipedia. get exposed. Its very good article really appreciated!